Story Cards are one of the primary artifacts of Scrum and Extreme Programming (XP) projects. Story Cards are written by stakeholders to describe high-level definition of a requirement. The stories can be both big and small. It is up to the developers to ask for clarity if it is too big, and combine it with related stories if it is too small; this is a feedback loop with the stakeholders. Then the developers can estimate the effort (time) and complexity (risk) of each story so that the stakeholders can set the priority correctly. The concept of ‘effort’ can vary from project to project. Some teams say that ‘effort’ includes both time and complexity. We’ll leave that to the reader for the moment. 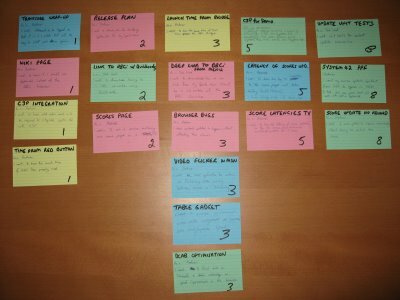 A photograph of sample user stories written on colored index cards. Here is a good background tutorial for those readers new to agile development. For you advanced agile modelers, learn more about the image above and agile velocity management here. You have to select businesses that are going to be around long enough for Mister Market to offer a price that is acceptable. You have to understand the intrinsic value of the business and whether Mister Market is offering to buy for more than the intrinsic value or sell for less that the intrinsic value. You have to monitor the profits as at least one key indicator of intrinsic value fluctuations. You have to select reasonable buy and sell rules to get your expected returns. You need to monitor your pool of potential businesses to decide if it’s worth trading out of one investment so you can buy into a new one. What if those were User Stories? I’d like a way to select businesses that are going to be around long enough for Mister Market to offer a price that is acceptable. I need a tool to capture intrindic value, so that I know whether Mister Market is offering to buy for more than the intrinsic value or sell for less that the intrinsic value. I want to monitor the business profits and maybe other key indicators of intrinsic value fluctuations. I want to set/save my buy and sell indicators, so that I can select my expected returns. I want to store a collection of business in a group and monitor them along side the businesses I have already invested; so that I can decide if it’s worth trading out of one investment and buy into a new one. You look around the room and say, ‘What is this stakeholder talking about?’ – How do we know how long a company is going to survive? Where is he going to be selecting them from? We know he has read The Intelligent Investor and Security Analysis; are we supposed to implement the whole two books!!! Obviously we can ask the stakeholder these same question, in a slightly nicer tone; or, we can provide a modified story card with appropriate estimates. We could of course just pretend we know what was asked and build the simplest possible solution. Even, if we did that, it begs the question of what kind of User Interface? Is this on a tiny 4 inch smart phone? An iPad? A website? Do the stakeholders want all of these methods of accessing the system? These User Stories seem to need a Context, or in Short Story parlence, they need a background and a setting in which they take place. The background here is the Intelligent Investor (at least we hope so), who has some understanding of value investing. They will want to monitor their stocks on their smart phones, and they want a bit of an arm chair investing feeling when they get home to their iPads and Web Surfing. Our best bet is to send back a new User Story (or 2) and see if the Stakeholders can help with this dilema.